Thrumpton is a small, attractive Trent-side village in South Nottinghamshire. 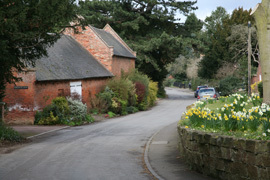 The village lies just off the A453, 4 miles from junction 24 of M1, 2 miles from East Midlands Parkway station and 6 miles south of Nottingham. A limited bus service funded by Notts County Council and operated by Littles Travel Ltd serves the village Monday to Saturday.